Artisteer ($50 Home & Academic Edition, $130 Standard Edition; free demo of each) is a Web design app that takes an original simplifying approach to the problem of designing one's own Web space. By giving you an instant visual as you modify each bit of your page, you get instant feedback on your site's design. 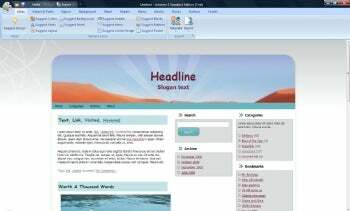 Artisteer uses Cascading Style Sheets (better known as CSS) to let you design your own website or theme for other Web content management systems like Wordpress or the more complicated Joomla (the latter is Standard Edition only; see below.) A single click lets Artisteer suggest from one of many pre-defined site layouts, or you can adjust individual options to your heart's content. There are two editions of Artisteer, and the demo lets you test each of them individually. The Home & Academic Edition can export as a standalone website or a Wordpress theme, and costs $50. The Standard Edition adds support for Joomla, Drupal, ASP.NET and CodeCharge, and includes a larger library of objects. It's $130. Both versions include one year of free upgrades.